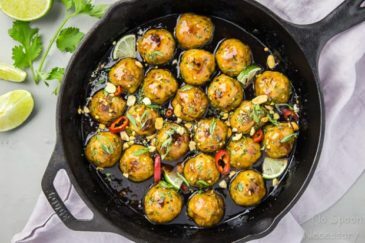 These Baked Chicken Apple Meatballs are tender, succulent and bursting with sweet and savory flavor. 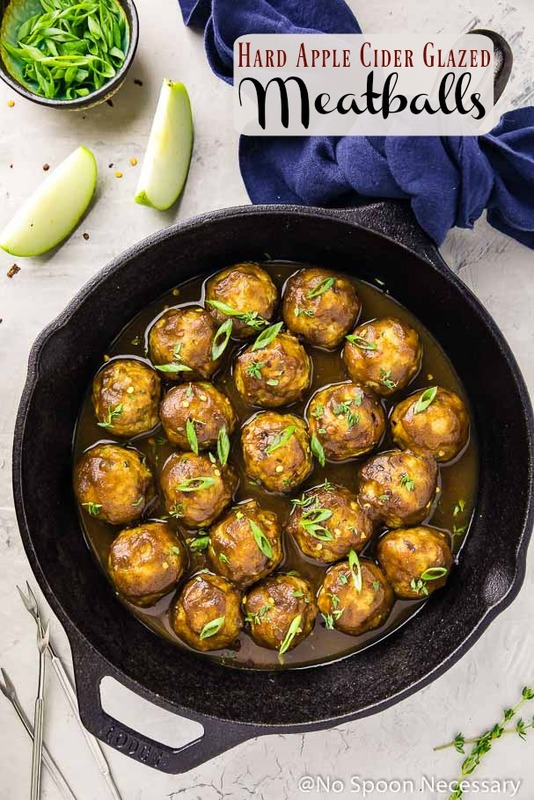 Baked for ease and convenience, then coated in a rich, silky smooth hard apple cider glaze, these meatballs are perfect for all occasions! From game day and holiday entertaining to snack time and dinner, these meatballs are marvelous and guaranteed to please! Happy one day until the weekend! Whadda ya say we blow the lid off this whole Thursday thing and celebrate the impending weekend early?! I see you nodding your head yes. ⬆️ This is why we are friends. And, I can’t think of a better way to celebrate, than with a skillet full of balls of meat. But not just any ‘ole meatballs! But not just any sassy, spiced meatballs! 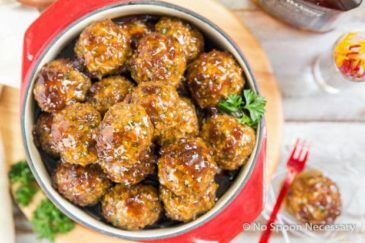 Sassy, spiced, HARD APPLE CIDER GLAZED meatballs!!!! AKA THE meatball of the fall season. Tender, moist, succulent chicken meatballs subtly spiced with warm seasonings and packed with crisp apple flavor. Generously tossed and lovingly glistening in a sweet, savory, smooth, rich hard apple cider glaze. Liberally garnished with fresh green onions, earthy thyme, and spicy crushed red peppers. These meaty bad boys, my gahhh! 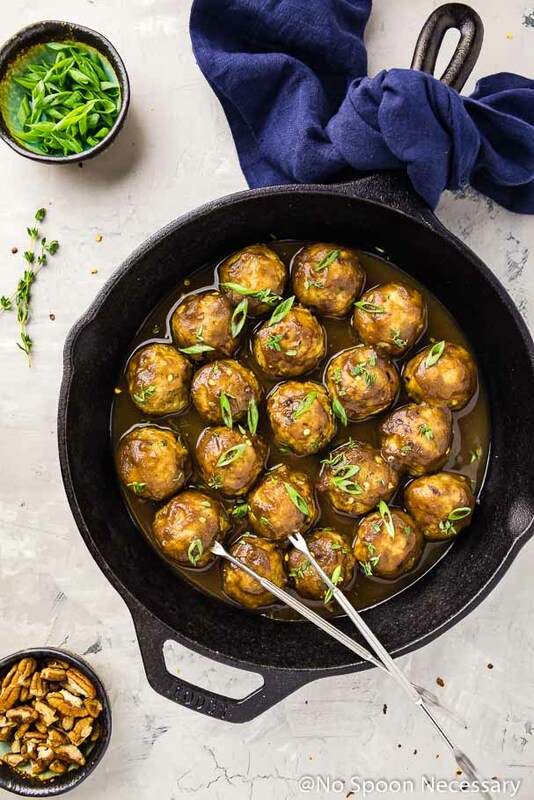 These Baked Spiced Hard Apple Cider Meatballs are SO gosh darn good they will rock your face off. And in your mouth?! It’s like a party in the USA. The secret to these sassy spiced meatballs? Silky, slightly sweet, cinnamon-y apple butter is ALL UP in this, my friends. 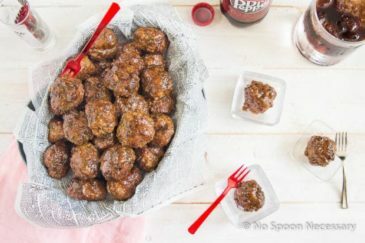 I’m talking, a DOUBLE DOSE of apple butter – both in the meatballs themselves AND in the glaze. And it’s straight up GLOOOORIOUS. How long do you cook chicken meatballs in the oven? The length of time you baked chicken meatballs directly depends on the size of your meatballs and the temperature of your oven. 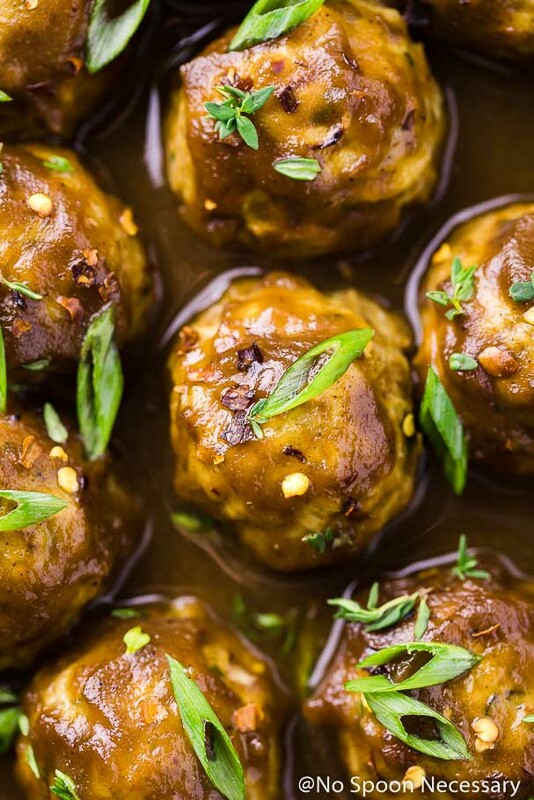 If you form these chicken apple meatballs into golfball-sized meatballs, they will take approximately 18-22 minutes to bake at 400 degrees F.
You should always bake meatballs until an internal temperature of 165 degrees F registers on an instant-read thermometer and until the juices run clear. 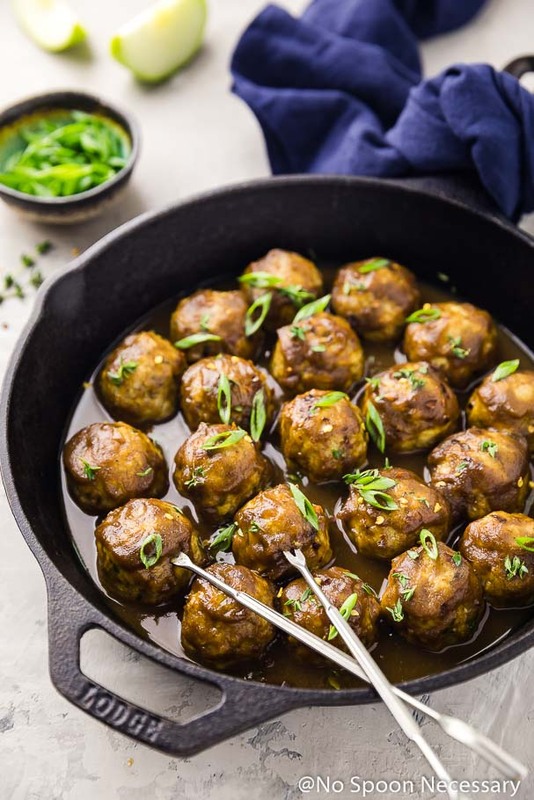 If you are using all dark meat chicken in your meatballs along with tons of breadcrumbs, your chicken meatballs will not be as healthy as a meatball made with lean, white chicken meat and little to no filler. 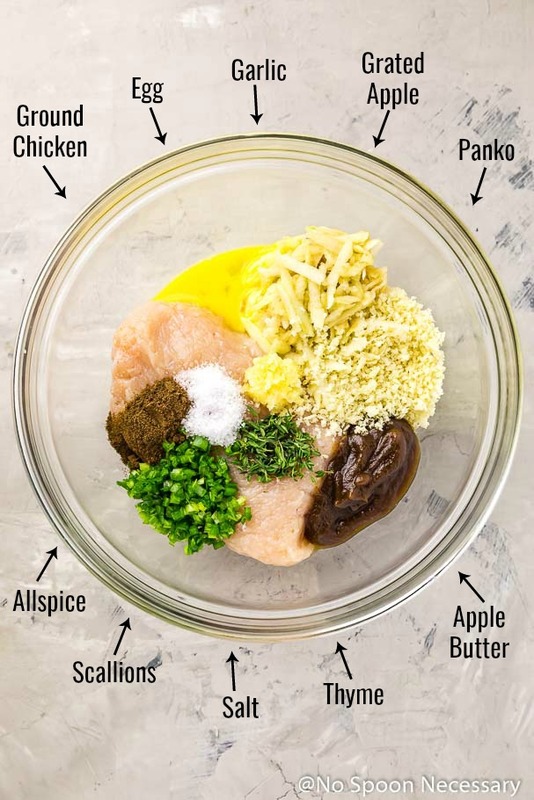 The chicken apple meatball recipe below allows you to use lean ground chicken, or combination (dark and light meat) ground chicken. As well, grated apple is added to the mix and the recipe only calls for 1/4 cup of panko breadcrumbs. 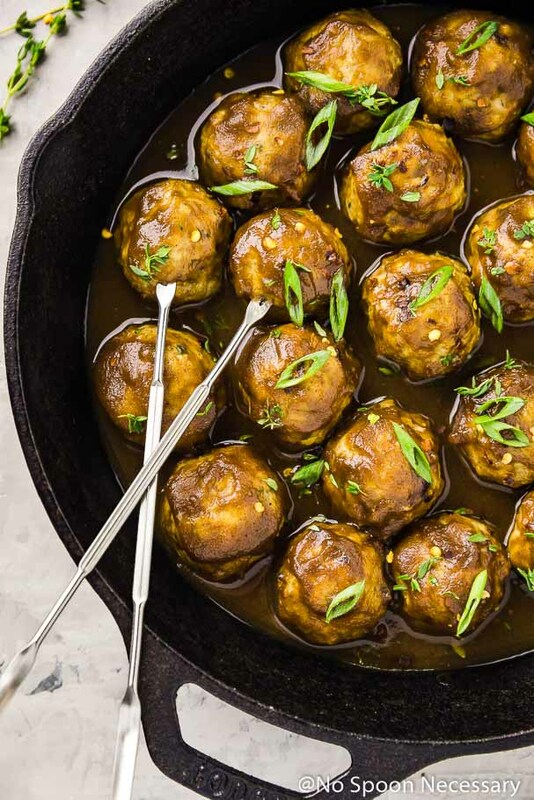 Compared to other chicken meatballs recipes out there, this one is on the healthier side! I used ground chicken in my meatballs, but feel free to use whatever type of ground meat you would like. Ground turkey or pork would be a great substitution, but ground beef will work too! If you are using ground chicken, I highly recommend you do NOT go with all white meat ground chicken. All ground chicken breasts tend to make the meatballs less juicy and flavorful. 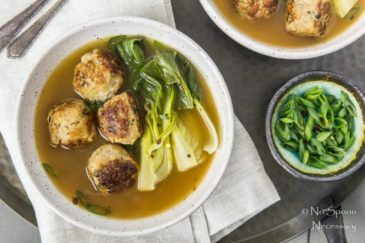 The recipe for these Apple Cider Meatballs below calls for ½ cup of grated apple, which is roughly ¾ of an apple. I used a Granny Smith apple because the tartness balances the sweetness of the apple butter, but feel free to use any variety that hold up well under heat. Honey Crisp and Pink Lady are both excellent substitutions. To keep the meatballs from sticking to your hands when rolling them into balls, lightly oil your hands. This trick works like a charm! Also, make sure you DO NOT roll your meatballs into a tight ball. When meatballs are packed too tight they end up tough and chewy after being cooked. Make sure you form your meatballs into roughly the same size. You don’t need to be overly obsessive, just make sure they are around the same size. If you want to be precise, you can use a small ice cream scoop (it’s what I use). You can make the meatballs mini sized or jumbo sized if you want, just see the above note (#4) and scale down or up the baking time accordingly. You cannot taste the alcohol at all in these meatballs, however if hard apple cider isn’t your thing, feel free to use plain apple cider! These apple meatballs taste amazing over mashed potatoes!! So if you are looking to serve these as a main course, do it with some mashed ‘taters! Sweet, savory and delicious to the max, these Baked Chicken Apple Meatballs are perfect for game day, holiday entertaining, or simply served over mashed potatoes for dinner. Regardless of how you serve them, I pinkie-promise you are going to LOVE them! Until next week, friends, cheers – magnificent meatballs! 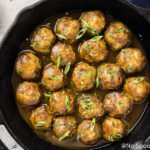 These Baked Spiced Hard Apple Cider Glazed Meatballs are tender, succulent and bursting with sweet and savory flavor. 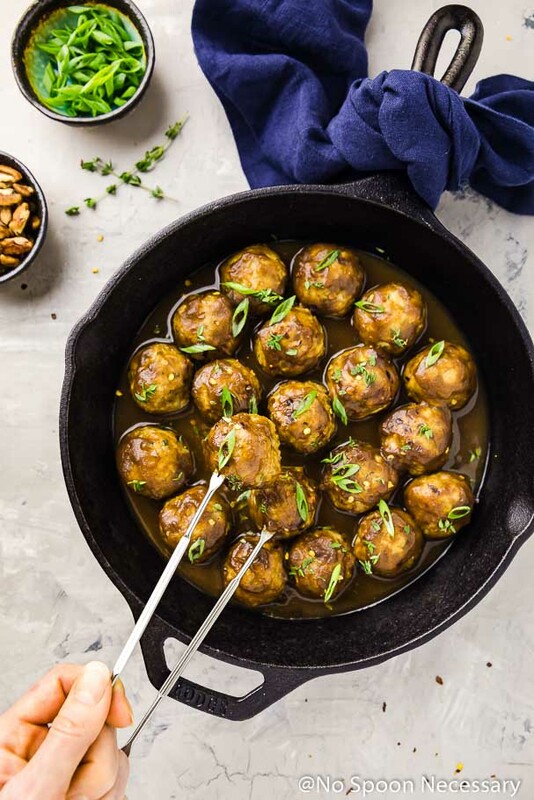 Baked for ease and convenience, then coated in a rich, silky smooth hard apple cider glaze, these meatballs are perfect for all occasions! From game day and holiday entertaining to snack time and dinner, these meatballs are marvelous and guaranteed to please! Preheat oven to 400 degrees F. Line a large rimmed baking sheet with parchment paper or foil for easy clean up. Make the meatballs: In a large bowl combine all the ingredients for the meatballs. Use your hands or a rubber spatula to gently mix until just combined. Do NOT overmix. Form the meatballs: Using wet hands to prevent sticking, roll the mixture into golf ball-sized meatballs (about 2 tablespoons of the mixture for each). If the mixture is too wet, add 1 tablespoon of panko, at a time, to the mix until it is easier to shape. Transfer meatballs to prepared baking sheet. Bake for 18-22 minutes, or until lightly browned and meatballs are cooked through. MEANWHILE, make the glaze: In a large skillet combine all the sauce ingredients. Season with ½ teaspoon salt and pinch of pepper. Whisk to combine. Place the skillet over medium heat and bring to a gentle simmer. Reduce heat to medium-low and cook, whisking occasionally. for 6-8 minutes, or until sauce is slightly thickened. Reduce heat to low and add the meatballs. Gently toss to thoroughly coat the meatballs. To serve: Transfer the glazed meatballs to a serving dish and top with optional garnishes. Enjoy! 1. I used ground chicken in my meatballs, but feel free to use whatever type of ground meat you would like. Ground turkey or pork would be a great substitution, but ground beef will work too! If you are using ground chicken, I highly recommend you do NOT go with all white meat ground chicken. All ground chicken breasts tend to make the meatballs less juicy and flavorful. 2. The recipe calls for ½ cup of grated apple, which is roughly ¾ of an apple. I used a Granny Smith apple because the tartness balances the sweetness of the apple butter, but feel free to use any variety that hold up well under heat. Honey Crisp and Pink Lady are both excellent substitutions. 3. To keep the meatballs from sticking to your hands when rolling them into balls, lightly oil your hands. This trick works like a charm! Also, make sure you DO NOT roll your meatballs into a tight ball. When meatballs are packed too tight they end up tough and chewy after being cooked. 4. Make sure you form your meatballs into roughly the same size. You don’t need to be overly obsessive, just make sure they are around the same size. If you want to be precise, you can use a small ice cream scoop (it’s what I use). 5. You can make the meatballs mini sized or jumbo sized if you want, just see the above note (#4) and scale down or up the baking time accordingly. 6. You cannot taste the alcohol at all in these meatballs, however if hard apple cider isn’t your thing, feel free to use plain apple cider! 7. These meatballs taste amazing over mashed potatoes!! So if you are looking to serve these as a main course, do it with some mashed ‘taters! Thank you for a fabulous recipe!! We were searching for recipes that featured products from an apple orchard where we were having a private cocktail event This recipe was perfect!! We used the orchard apples, hard cider and apple butter and made sure to use all fresh herbs. For the meat we ground boneless skinless chicken thighs. A tablespoon ball scoop was the right appetizer size. We made them the day before and reheated them in a roaster pan two hours before setting them out in the chafing pans. We served 150 people with rave reviews! Thanks for a keeper! I’m absolutely thrilled you loved this recipe! 150 people is quite a crowd and I’m so very happy to hear everyone enjoyed the meatballs!! Thank you for coming back and letting me know how it went over! You’ve made my day! Cheers!